Grocery first launched with a major improvement to how grocery lists are automatically sorted. The app remembers the order that items are checked off and maintains that order the next time you shop. That's a major improvement over manual sorting, and over beacon-based sorting systems that rely too heavily on the user's location inside of a building and are only available at a handful of stores. Grocery 2.0 represents a major improvement to how recipes are displayed on iPhones. The app lets users optimize their recipes by placing the ingredients next to the steps they're used in. That's a major improvement over traditional recipe apps and websites that structure a recipe as a block of ingredients and a block of steps. The screen isn't big enough to show the entire list of ingredients alongside all of the steps, and so you end up scrolling back and forth between steps and ingredients to see how much of something you need to add for the step you're working on. It's very inefficient and it's also easy to get lost and forget a step or ingredient. It's not a great cooking experience. Markdown is what we're using to make this possible. Our recipe format uses a subset of markdown to represent key components of a recipe. When users create recipes in Grocery, we're adding each ingredient, step, header, and note as a separate line to a markdown text file in the order they specify. We've found that to be all the flexibility required to write very intuitive and easy to follow recipes that work really well when displayed on iPhone! Of course, that flexibility also allows users to structure their recipes in Grocery the traditional way, with a block of ingredients and a block of steps. Indeed, if you try to copy a recipe from a website into Grocery that's essentially what you'll end up with. Optimizing the recipe into sections with their associated ingredients and steps takes a little bit of work, but I think it results in a much nicer recipe that's more fun to cook with. Before Grocery 2.0 launched I went through all of my recipes that I had saved and added them to Grocery. I had recipes saved in other apps, bookmarked, sent to me in emails, and saved as photos from family recipe books. I went through each one and optimized it for our new format. The result is a personal recipe book that I hope to keep forever. That feels like a realistic goal when each recipe stored as a markdown file that can be opened by any text editor! One example of a recipe I added is my mom's Fudge recipe. This is a recipe I remember helping her make for years and something I never want to forget. The original recipe was handwritten on a piece of paper. As expected, all of the ingredients are at the top and the steps are at the bottom because they all fit on one piece of paper. But they won't all fit on one iPhone screen so we need to figure out what order to arrange everything in while adding the recipe to Grocery. Making Fudge starts with melting together the butter, sugar, and evaporated milk, so that's the first section in the recipe. Those three ingredients are the first things in the recipe, followed by a step that describes what to do and includes a 5 minute timer. I was actually home with my mom while adding this recipe, and we remembered that Fudge requires heating the mixture to a specific temperature, but we couldn't remember what that temperature was. After looking it up and adding to the recipe we also decided to add a note to the recipe with a link to where we found that temperature! Now we'll have that as reference if we forget again. The next steps are mixing in the chocolate, marshmallow cream, and vanilla, followed by nuts if desired. I added each of these to the recipe as ingredients or steps, specifying the amounts for each ingredient. The result is a recipe for making delicious Fudge that's easy to follow on an iPhone! Grocery's recipe view includes a few other features to help make sure you'll never forget an ingredient or a step. Tapping on an ingredient or step while cooking checks off that cell in the viewer, marking it as completed. That state is preserved until the recipe is finished cooking so you can go browse other recipes or quit the app and still come back to the recipe later. Efficiency with cooking paired with efficiency for shopping makes for an amazing cooking experience. I've always loved cooking but working on Grocery and adding these recipes has made me more passionate about it than ever. I hope you try it out and let us know how you like the recipes you create! The story of Grocery 2.0 begins around Christmas of 2017 with a family recipe book. Ryan and I were back home with our families looking up recipes and planning holiday meals. After picking a recipe to make you typically add the ingredients to your grocery list and go shopping. We both wanted to have our recipes in Grocery to make adding those sets of ingredients easier. I think it's important that this realization happened with family recipes because family recipes are very special. To many people, they’re as special as family photos: passed down generation to generation. If we added recipes to Grocery it would need be a great recipe feature that we could trust with those recipes. We set out to do just that and started design in January of 2018. The obvious next step after design would have been to hit File -> New View Controller in Xcode and start adding a recipe screen to Grocery. Instead, we created an entirely new Xcode project to iterate quickly on our recipe concept. Our goal was to prove that our design worked and bring what we learned back to Grocery and quickly ship our recipe feature. We eventually did bring that recipe feature back to Grocery and we’re excited to be shipping it in the app today! But along the way, we also re-wrote virtually all of Grocery’s UI in a way that greatly improves the consistency of elements throughout the app, as well as how code is structured for re-use across screens. One way to look at it: Version 1.0 was basically our prototype. Version 2.0 is the real deal. That probably sounds weird if you've already been using 1.0 and love it. We love it too! But for multiple technical and user experience reasons I can safely say that 2.0 is a huge improvement, not only to the experience of using Grocery but also to its technical future for many releases to come. What’s the deal with a new Xcode project? I initially resisted adding recipes to Grocery because I was in love with the idea that Grocery is just a simple shopping list. Building recipes seemed incredibly complicated. You need a list to view all your recipes, a recipe viewer for cooking and selecting ingredients, and an editor to create new recipes. You need a place to safely store all of the recipes a user adds, with all of their section headers, ingredients, steps, notes, timers, and photos. Our entire concept for recipes hinged around using markdown to improve flexibility for displaying recipe content. We wanted our recipes to stand the test of time with an open document format that supports interleaved ingredients and steps. Testing this theory in the new Xcode project proved that a basic UI for creating recipe-focused markdown files was easy to use for adding recipes. ✅You can read more about the recipe markdown format we arrived at on GitHub. Recipes need to be shareable across devices and with friends and family members. But we weren’t sure how well recipes sync between devices if we stored our recipe markdown files in iCloud Drive. We tested this feature by adding support for reloading a recipe in real time as changes are made on another device, which actually works VERY well! Syncing is surprisingly quick. Multi-line text has always been a challenging problem because every cell in your list could have a different height. Grocery 1.0 supports Dynamic Type, which requires some variation in the height of each cell, but we still limited the length of items in the list to a single line. That would never have worked for recipes that usually include long steps that span several sentences. So instead of a standard table view, we built the recipe screen as a collection view and worked through all of the details to get multi-line text working. Our solution worked really well for recipes, and we even made the solution re-usable so that we could use it in other screens like the recipe list and ingredients list. We'd been wanting to introduce different app theme colors for a long time. Because why not? Building new UI components from scratch in the new project seemed like the perfect time to try it! We ended up with a very clean solution using a notification system that lets each component style itself for the selected theme. We even used Swift enums for all of the theme options! We had assumed that there would be a new system dark mode setting in iOS 12 that we'd be well on our way to supporting, but that only debuted on the Mac. We'll be ready if that ships in iOS 13 though! What else did we get from a new project? Using a new Xcode project to develop recipes helped us solve a lot of problems quickly, but we actually got a lot more out of it than we could have predicted. Each component supports theming and multi-line text for all of its labels right out of the box. Multi-line support also extends to images which are automatically sized to fit the width of the screen with their aspect ratio intact. The components were exactly what we needed to build a flexible recipe layout system, but also worked great for building any other screen we wanted to. The recipe feature works! Now what? Our original plan called for iterating quickly on recipes in a new Xcode project before bringing the recipe feature code back into the Grocery project. In my head that essentially meant moving some files from one project to another and linking them together to present the new recipe screens. There still wasn’t anything wrong with that plan. Grocery was still working well, and we wouldn’t have to make any changes to Grocery before inserting the new recipes feature. There was essentially zero risk to Grocery by going this route. Why would we consider doing anything else? We were way more excited about the UI system we had created in the new project than we were about the UI we had created in Grocery. The code was a lot nicer to work with, and the components fully reflected our entire visual style for the app. By this point we had committed to shipping new app themes alongside recipes, and our component-based layout system already supported theming. We'd been fine tuning the marginal layout in the prototype and it simply felt nicer and more consistent than some of the layout in Grocery. We were building every new screen with these components, and so all of the screens benefited from those improvements. The original Grocery project essentially used different table view cells for each screen. The Grocery List and Quick Add screens had different cells to accommodate one having a checkmark selection and one having a circle selection. There were different cells for settings too, and for lists and stores. This of course caused plenty of issues any time we decided to tweak our layout spacing in the app...which led to us not doing that very often. You never want brittle code to be a reason to avoid change, and our original layout code was too brittle for our liking. Instead of just moving recipes back into Grocery and calling it a day, we decided to re-build the existing Grocery UI using the new component-based layout system without changing Grocery’s existing model layer. We still loved Grocery's internal model and controller layers. The interaction with Reminders, our internal sorting algorithm, Apple Watch, and the Realm database that we use for sorting were all very solid and abstracted out into their own classes. Besides support for themes, we also knew that two of the screens in Grocery needed to be overhauled before our next major version anyway: Stores & Lists, and Settings. Confusion about the difference between Stores and Lists and how to have items associated with a specific Store was easily the largest source of customer feedback from Grocery 1.0. We'd been brainstorming solutions to that almost as long as we'd been working on recipes! The solution we arrived at was to merge Stores & Lists into one feature called Stores, and give each Store an assigned Reminders List. That gives users the flexibility to configure Stores however they want to: with a shared list for multiple stores, or a unique list for each store. The new Stores feature was different enough from the original that it really needed a brand new UI no matter what. The original store/list selection screen just didn’t make sense for the new feature. "I'll take three cells with images on the left, titles, and notes on the right; a section header with some top spacing; two cells with some text and images on the right; one cell with two lines of note text; and two cells with tinted titles that make them look like buttons." We re-built settings in the same manner, and that only took a weekend to finish. Because the logic behind most of these screens is relatively minimal, handling all of the layout through shared components cuts out most of the work for adding new screens. Of course, this component-based layout system only works within the constraints of what our shared components can be configured to do. Adding an entirely new "type" of component still means work. But knowing which components exist and how they can be customized is also really helpful from a design perspective because you have a better sense of what your palate looks like while designing a new screen. If you use those components in the design, you know it's going to be easy to build. It's really a tide that lifts all ships. Grocery is still a pretty simple app. When you exclude the Recipes, Stores, and Settings screens that we already re-built...the only thing left to rebuild is the list screen itself. I have to admit, the list screen was a little embarrassing to behold. It was actually still called ViewController.swift from when I first created the Grocery Xcode project in January of 2017! ViewController.swift wasn't quite as massive a view controller as it could have been, in part because of how much logic Grocery had abstracted out into classes that could be shared with the Apple Watch app. But it was still cluttered and disorganized and largely incompatible with the multi-line layout and theming features we were adding in 2.0. The new list screen is infinitely nicer and actually has a real name: GroceryListViewController.swift! Some pieces of the original ViewController had an obvious home in the new GroceryListViewController. If a method is simple and important, just putting it into a more organized place in the new GroceryListViewController or one of its extensions was all that was needed. I saw those pieces as low hanging fruit and tried to move all of them first. Anything I moved to the new GroceryListViewController I also deleted from the old ViewController. Select a method in the old ViewController. Figure out what it's doing. Write a new method in GroceryListViewController that implements the essential features of the old method, generally using newer support systems. Delete the old method from the old ViewController. As the ViewController file shrank, other files related to the new GroceryListViewController grew. The refactor would be complete when ViewController.swift was empty and could be deleted from the Xcode project. The most care was needed around features like Drag and Drop. Grocery's original table-view-based drag and drop was incompatible with the new iOS 11 Drag and Drop that supports dropping items from other apps. That sort of refactor required saving the underlying logic of what to do when an item is dropped while supporting a new type of user interaction. Gaining support for features like iOS 11’s Drag and Drop was yet-another reason that I'm glad we decided to give the grocery list screen a do-over. Eventually the last method was removed from the old ViewController.swift and the file was deleted from the Xcode project. Refactor complete! Once the refactor was finished, every screen in the Grocery project worked the same way. Having one way of doing things makes the app easier to maintain because there's less context switching across features, and less surface area for bugs to pop up. That by itself can be a very valid reason to perform a major refactoring effort if it means unifying the way core functionality in your app works! A friend at work asked an important philosophical question recently: if you replace every plank on a ship is it still the same ship? Grocery still feels like the same app to me. Sorting the list and adding items still works the same way. Settings carry over to 2.0, with the addition of a few new ones. Quick Add works the same way. But using the app with recipes and themes is so much nicer as a user, and the code base is easier to work with as a developer. I'm not sure if it's truly the same ship or not, but I do know it's a ship I love using and working on! We're really excited for people to try the new version and hope that you enjoy it. Grocery is free to download and available on the App Store! The upcoming release of Grocery focuses on speed. We can all agree that the main thing your app does should be fast, and for Grocery that's checking items off your list. As we added features to the apps the performance of checking items off a list slowed down - a lot. For some users, checking off items could take 3-4 seconds on iPhone, and 5+ seconds on Apple Watch. We needed to address that now before adding more features. The problem on iPhone was simple to understand and solve using Instruments. When you mark an item off your list on the iPhone, we were waiting for the update to Reminders to finish before moving the table cell. Making that update asynchronous and moving the cell immediately solved the problem. When you mark an item off your list now, the list update happens instantly, just like it should be! The problem on Apple Watch was harder to understand and harder to solve, and that's the focus of this blog post. Troubleshooting performance on Apple Watch can be tricky. You can try to identify red flags if they exist by running Instruments against the simulator, but the only way to truly evaluate performance on Apple Watch is with the physical device itself. Everything that seems slow on device will feel completely normal on the simulator. You have to test on hardware to solve the problem. Grocery's Apple Watch app is very simple - just one table view where tapping on a cell checks the item off your list. That's why this particular issue was so perplexing: the app isn't doing anything that seems too complicated. When an item button is pressed, the app sends a message to the iPhone to tell it which item was checked off, and then removes the cell from the table view. The app isn't updating the Reminders database itself, so why is it so slow? Time to investigate! When tapping on a button feels slow on the Apple Watch the best thing to do is remove everything from the IBAction method and test it again. Button taps should feel as close to instant as possible on the watch. That's a major focus for watchOS 4 with the Unified Process Runtime - making touch interaction feel even faster and more reliable. If you remove everything from your action method and performance returns to normal, then you know something in that method is causing the slow down. Sure enough, after commenting all of that out things felt fast again. This approach is also very motivating because you get to see how fast it can feel which makes you want to achieve that performance with the rest of the functionality restored. While you're working on the button action method I think it's a great idea to refactor and re-organize the functionality of that method into smaller methods with a single responsibility. As I had been adding features and functionality to that button action I had just been adding them to the same method. I took this opportunity to move each area of functionality into its own method. This has the dual benefit of cleaning up the code as well as making it easier to see what you're turning on and off while evaluating button performance. I started adding functionality back one piece at a time, beginning with the most trivial pieces that I assumed wouldn't have any impact on performance. I installed a new device build after each piece to test performance on a physical watch. Most of the trivial features didn't affect performance at all. Haptics and hiding the placeholder group had no impact. Drawing a strike-through line through the item label with an attributed string didn't seem to hurt. Removing the table cell and removing the item from the array didn't hurt either. Updating the remaining item count was the first place that I noticed a small change in performance. That involved counting the number of remaining items and updating the Interface Controller's title property. The change was barely noticeable though, so I decided to keep that feature in. The next seemingly trivial feature I added back to my button action was updating the complication. Updating the complication isn't slow on its own, but the way I was updating the complication was triggering a reload from the Reminders database. When I added this method back to my button action performance slowed down considerably. Once that happened it gave me an area to investigate further, which lead to identifying the database reload. By addressing that issue I was able to reload the complication after marking an item off the list without hurting button performance! The two major problem areas turned out to be updating the sorting order on the watch, and sending the message to the iPhone to tell it which item was marked off the list. Updating the sorting order was actually completely unnecessary. In an earlier version of the Apple Watch app we had been moving marked off items down to the bottom of the list instead of removing them. Removing them from the list made more sense because of the small size of the Apple Watch screen. When we changed that behavior we didn't remove the sorting change - which was actually a pretty significant performance penalty. Removing that made a huge difference! Sending the message to the iPhone using Watch Connectivity made more of an impact than I expected it would. Making that method call asynchronous by calling it on a background queue made our button action feel a lot faster, so that was the only change we needed to make there. Once all of the button action features are refactored, removed, disabled, moved, or improved then it's time to put it all back together and test the final product out to make sure that all the effort actually made a difference in performance. After a few days of testing it's definitely feeling like a big difference. Troubleshooting performance on Apple Watch can be tricky but the effort is well worth it, especially for a device intended for small and quick interactions. It's truly a device where every second counts, and a little bit of testing can help make the difference between an app that feels fast and an app that feels too slow to use. Even with the upcoming improvements to app performance with watchOS 4, anything that we can do to help our apps feel faster will make a big difference for Apple Watch users. I'm excited to introduce Grocery, a new app that Ryan Considine and I built specifically for grocery shopping with the goal of making trips to the store more efficient. We started the project with a question — what if our app knew the path we took through a store, and how would it use that to make the trip more efficient? What we are launching is a simple shopping list with a focused interface that includes a lot of intelligence to always keep your list sorted in the order that you shop. Sorting a grocery list is no small task. There's no end to the variety of different ways that people shop. Paper lists are still very common, and people have different ways of manually sorting their lists. Grocery store layouts are almost as varied as individual people's shopping behavior — even among the same chain of stores. Some stores have tried to solve this problem with technologies like geolocation and beacons, but those are expensive to install, unreliable to use, and just haven’t caught on. We wanted to build something that would be easy and reliable for everyone to use, regardless of store location or shopping habits. Our first step was to create our own intelligent sorting algorithm that can learn from an individual's shopping behavior. This is a new approach that we haven't seen applied before, but we chose to pursue it because it doesn't require hardware or analytics, or even a user's location to build a custom sorting order. The algorithm we built learns from each trip you make to the store and sorts based on the order you shop for items and check them off your list. All of this analysis is taking place on the user's phone and stored locally. We aren't doing any machine learning in the cloud — not just for privacy reasons, but because there's no need. Everyone shops differently, and we don't need to learn from someone else's behavior to build a better sorting order for you. After this trip to the store, Grocery knows how to sort all of these items relative to each other, and because you previously shopped for Avocados, it also knows that these items all come before Eggs and Milk. If your next trip to the store is for Kale and Eggs, Grocery will know which item comes first and sort your list accordingly. Efficiency in the store is our number one goal for Grocery, and an even more efficient place for the app is on the Apple Watch. We learned early on that the Apple Watch was a great device to use at the grocery store because it keeps your hands free to hold items or push a shopping cart. We wanted the Apple Watch experience for Grocery to be the best possible. To that end we actually built the Apple Watch UI before we started on the iPhone. We spent a lot of time optimizing it to be as fast as possible - which is key for third party watch apps. Always having your Grocery list in sorted order is the key to an efficient and effortless user experience on the watch. Because your list is in order, the item you just put in the cart that you’re looking to check off is visible immediately after raising your wrist without your needing to scroll to find it. Raise your wrist, tap the item to check it off, look at the next item on the list, and lower your wrist. It’s a very quick interaction that makes shopping with the Apple Watch feel easy and efficient. We also wanted adding items to your list to be as simple and fast as possible. The iPhone UI for adding items is optimized around speed and efficiency. The text field for adding an item and associated notes is always present at the bottom of the screen, within easy reach. Tapping the + button after entering an item keeps the keyboard up, ready to enter more items. And we built our own autocomplete system that populates from your personal history of purchased items, making repeat entries fast and easy. You can also add items to the list on your Apple Watch, via dictation or scribble, or by picking a past item to add back to your list. We've all been in places where using our watch to do something is simpler than taking our phone out, and we wanted to make sure Grocery supported that use case. But we didn't stop there. You can also add items to your Grocery list from the Mac, iPad, iCloud, and Siri! And even, via IFTTT, from Alexa. That's because Grocery is built on top of the iOS Reminders database, which supports shared lists on iCloud. When you start using Grocery, we prompt you to create a new list called "Grocery" (which you can change if you want to), that can be edited from any device with the Reminders app, or access to iCloud.com. Support for Siri is something we've really grown attached to. Even the phrasing is simple with the default list name — "Add Eggs to my Grocery List", and items show up immediately after they're added. Voice assistants like Siri and Alexa work great in kitchen settings, and adding items to your shopping list that way is a great example of why. And finally, because we're supporting iCloud Reminders lists, you can also share your list with a partner or roommate, and they can add items to your shared list from Grocery or from the Reminders app. You'll each see the items the other added in your list - but each person will still have a unique sorting order based on the order in which each person shops for items. Grocery is launching today as a free app that includes Google app install ads, with an optional in-app purchase to remove ads and support future development of Grocery. We love using the app and are excited to introduce it. We hope you enjoy it! Like many other pro Mac users I was very surprised and excited to hear that a new Mac Pro is in the works. I don’t think I actually believed the Mac Pro was dead, at least not deep inside. But I had certainly come to terms with never buying one again…until now. Before the Retina iMac, I used pro Mac towers for almost 10 years. I used a Power Mac G5 from 2005 to 2010 and a Mac Pro from 2010 to 2014. If there’s anything I took away from the experience of using pro Mac towers, it was the incredible performance. When I upgraded to the Mac Pro in 2010 the dual PowerPC CPU’s in my Power Mac G5 still felt like they had more in the tank. Those Mac Pro’s are famous for their longevity - mine was still performing very well when my iMac arrived. What I want out of a new Mac Pro is a return to that level of performance longevity. The old Mac towers were relevant for 5+ years after you bought one. They stayed relevant because they used the highest quality parts currently available and had some user-replaceable parts. In both towers I owned I upgraded the RAM several times after I bought them - eventually reaching max capacity as I could afford it and the system felt like it needed it. I upgraded the Power Mac’s GPU to an Apple-sanctioned optional X800. I upgraded the Mac Pro’s storage many times over the years before eventually installing PCI-e SSDs in the giant tower - a massive boost to storage performance. When I moved away from the towers to the iMac I also moved all of my primary storage to external drive enclosures. That experiment was a success. Apple made a big bet on Thunderbolt for expansion. From my experience, that was the right move. My Mac Pro had 8 internal drives at the end (4 in the 3.5 bays, 2 in the optical bays, and 2 PCI-e slots). That setup was convenient, but it wasn’t necessary. Thunderbolt enclosures are more affordable and the available storage capacity of SSDs and cloud storage has risen significantly. There are plenty of options to choose from now to increase storage capacity and performance. I’m very happy with the Thunderbolt storage system that I’ve been using with my iMac. The biggest concern I had with the Retina iMac was graphics. Unfortunately I think that concern was valid. The GPU industry is advancing at an incredible pace, and the lack of an ability to upgrade the GPU is going to limit how long my iMac stays relevant for performance graphics. I don’t blame the iMac for that - the iMac was never intended to have upgradable or full-size GPUs. But what I want from a new Mac Pro is exactly that: upgradeable industry-standard GPUs. The older Mac towers had upgradeable GPUs after a fashion, but it was clearly an edge case. I’d really like to see Apple focus on solving this particular problem for pro users. As a long time Mac tower user, I agree with all of those cuts except for PCI-e. Optical drives are clearly dead, and Firewire support is easily gained through Thunderbolt hubs for legacy drives. Storage expansion through Thunderbolt is a very reasonable option for virtually everyone - and for the folks that don’t want to deal with spinning disk enclosures, the price of large SSDs is very close to affordable levels. But dropping PCI-e expansion was a step too far. PCI-e is a requirement for upgraded graphics, and is a great option for a lot of other expansion, including storage. I’m 100% on board with the suggestion ATP hosts made in “Thermal Corner” regarding adding additional PCI-e SSD expansion ports to the new Mac Pro. That would be a great step forward and go a long way towards keeping these machines relevant for years after you buy one. The other wish that I have for the new Mac Pro is this - keep at least two Thunderbolt 2 ports. I can see why Thunderbolt 2 might be on the chopping block for the new Mac Pro. USB-C may be the future, and I understand why Thunderbolt 2 was removed from the new MacBook Pro’s. But when Apple signaled the shift to Thunderbolt storage, a lot of pro users invested heavily in Thunderbolt storage setups for an iMac, 2013 Mac Pro, or MacBook Pro. Apple should make using these storage expansions as easy as possible for Mac Pro users, especially on a machine where storage expansion through Thunderbolt will be required. So will I buy a new Mac Pro? I think I will. My iMac will be about 4-5 years old at that point, and out of Apple Care. I wasn’t kidding about the graphics not holding up on the iMac. The iMac used to run Blizzard games at high settings when it was released, but lately I’ve had to reduce all of the settings to fairly low levels. The CPU is still one of the fastest that Apple has shipped in a computer, and the display is still amazing, but I think the graphics performance could be enough to convince me to upgrade. Next week I'll be presenting a talk on developing apps for Apple Watch at 360iDev in Denver, Colorado. I've been wanting to go to this conference for a long time and I'm really excited to be presenting this year. I've written and talked a lot about watchOS, and this time I'm going to try and share as much technical detail as I can about what it's like to develop for the watch. I think that watchOS 3 will make developing for the watch much more appealing for a huge number of teams and developers. I'm hoping that people who attend my talk will come away excited about building a watch app and ready to get started. My only regret going into the conference is the other talk during my time slot is one I'd really like to see! There are so many great topics and speakers that I'm really looking forward to being there this year. When I first heard about CocoaConf Yosemite I couldn't believe there was a conference designed around three very different things that I love: Apple, Photography, and the outdoors. I enjoyed the experience so much that I went back for seconds this year and had an even better time. The conference is returning for 2017, and I'm very much hoping to attend next year. It's hard not to feel inspired in Yosemite National Park. Spending time outdoors has always been a great way for me to recharge, but the serenity you can experience in Yosemite Valley is quite unique. There really is nothing else like it. If this were just a tech conference then Yosemite would still be a very special setting that people would get a lot out of. But CocoaConf Yosemite is more than that. It's a place to focus on the human side of working in the technology industry and why what we do with technology matters to other people. When I came to Yosemite last year I spent some time after the conference exploring the park. I had a chance to hike around by myself, which was a unique experience for me: I almost never go out hiking on my own. But it lead to some of the most amazing things I've had happen to me on the trail, like getting snowed in above Yosemite Valley! Snow! I woke up around 6am with a foot of snow outside my little backpacking tent. Getting out and hiking by myself was actually pretty far outside my comfort zone. But that also fits the theme of the conference, which really focuses on learning more about yourself. Pushing myself lead some amazing experiences, including witnessing the most amazing sunset I've ever seen, above Half Dome. A picture of the sunset from Cloud's Rest is my favorite picture that I've ever taken. But it's not just the picture I like, it's the experience that it represents. Talking to people in the valley to get ideas on where to hike to. Planning the hike and determining if I could make it safely to where I needed to go. Being totally isolated, knowing I was the only one witnessing this in person up in the snow, but being able to share the experience with people later through photographs. And knowing the whole time that I was out there doing something new that I enjoyed. Such is the power of exploring the outdoors, that just one sunset can mean so much to you. Sunset from Clouds Rest, overlooking Half Dome in Yosemite National Park. While I was exploring Yosemite that first year I had a few books with me. I read Becoming Steve Jobs by Brent Schlender, as well as Creativity Inc. by Ed Catmull. Both books taught me a great deal about leadership that I don't think I would have understood as well outside of a place like Yosemite. The conference and the environment were the perfect backdrop for listening to these types of stories. This year leadership was a central theme at the conference, as well as another trait I wasn't expecting: vulnerability. I had started reading Daring Greatly by Brené Brown before the conference and I kept marveling at the similarities between what was being discussed in the conference talks and the themes of Brené's book. Daring to be mediocre. The only thing between you and what you want to do is doing it. Be a little wild because we are in the wilderness. Be your own replacement. Challenge yourself. Having empathy for the point of view of others. Many speakers told stories of using 31 day challenges as a way to coach yourself into doing something you were interested in but not comfortable getting started with. It takes courage to start something new, especially something you don't know you'll be good at. Daring to be mediocre helps you take a step towards something you want to achieve but are having trouble getting started with. But the biggest takeaway I had from Yosemite this year was community, and how important it is. Sometimes it's easy to forget in the interregnum between WWDC's just how special the community is around the technology industry. The tech community is one that I think can be of immense service to others. I was so impressed by the talk Christa Mrgan gave on Civil Comments, a tool that is actually helping change people's behavior and positively influence the nature of discussion online. That's the type of impact we can have on the world, and I think it's a perfect example of why CocoaConf Yosemite is so great. It's about inspiring you to make a difference, in your team, in your company, in your community, in the world. CocoaConf Yosemite is the best experience I've had at a conference. If you haven't been I highly encourage you to go. I'm hoping to return again next year. Let me start by saying that I am very excited about watchOS 3. If I could have made a list and told Apple, "Here are the improvements I would like to see made to watchOS at WWDC this year" then I would consider that list to be thoroughly crossed off. A focus on performance, background updates for workout apps, and ditching the Friend button in favor of the new Dock are exactly what I wanted to see. A lot of people watching the announcements caught that one notable Apple Watch feature was omitted from the commentary. The App Launcher, or Honeycomb / Home Screen, wasn't mentioned in the keynote or subsequent discussion about how users interact with Apple Watch. The subtext is clear. I don't think Apple intends or expects people to interact with their watch by launching apps from the Honeycomb any more than we do. It's still clear that launching third party apps on the watch is very important. The Dock is a big step forward here but it can't be the only answer. The Dock is a more concise list of apps than the Honeycomb is, but the only context its aware of is which apps were launched recently or that the user favorites. The Dock is glance-able and meant to keep apps visible and freshly updated, but it's still not as easily accessible as the user's watch face with all of their complications. It's been clear for several months that complications truly are the best app launchers. That's why the new ability to easily swipe between watch faces is absolutely game changing for Apple Watch despite not being something I was expecting. Next to the flashy new Dock it's an easy thing to miss, but I think it will have the biggest impact in how I interact with apps on my Apple Watch. The Apple Watch apps that I launch regularly are ones that I have complications visible for. I routinely use two fitness apps, UA Record and Runtime, because their complications are so easily accessible to me. The only time I go deeper into the Honeycomb is to launch apps that I don't have room to show their complications...like Stopwatch, or Timer. I choose not to keep their complications visible on my watch face because they usually don't have any content that is contextually relevant to me. The significance of complications being the best way to launch apps is why swiping between watch faces is so valuable. It allows users to literally switch their context on the Apple Watch. One day this could presumably happen automatically, but at least it only takes one swipe to switch from your primary daily watch face to one with the type of information you want to have at a glance in another context. I love using the Stopwatch and Timer apps while I'm cooking or brewing coffee, but I don't want their complications visible during the rest of the day. The ability to swipe left and bring up an entire watch face devoted to them and any other complications relevant to cooking is a game changer for me. I'll keep my existing primary watch face configured with the date, and a few activity / fitness complications, and I'll also have my Movie watch face with no distractions that Ryan Considine inspired me to use. Apple clearly intended for this usage pattern to take hold when designing watchOS 3. Craig Federighi stated so himself in tonight's live episode of The Talk Show in San Francisco. Watch faces are the true app launcher for watchOS, and users will start to customize their watch faces based on the contexts that are most important to them. This is where I could see some really exciting things happen with the platform. Collections of activity and fitness complications seem very likely to become popular, as well as watch faces with complications related to travel. I hope Apple will use curation to promote this concept and apps with great complications because of how much better this will make the experience of using an Apple Watch. This is a really exciting week for watchOS developers. This is where the platform really starts to take off and we start to see what people will really do to build amazing watch apps. Lately I've been following along on the Swift conversation about static and dynamic features and the importance of the dynamic runtime. I'd like to share some of my thoughts as a developer who is using both Swift and Objective-C on an almost daily basis. The concept of using the right tool for the job is a bit of a cliché, but it describes my views on the static nature of Swift very well. I like that we as developers for Apple's platforms have great options on both ends of the spectrum. Swift is an excellent static language, and Objective-C and the associated dynamic runtime is a great tool as well. I haven't found myself only wanting to use one or the other. Maybe the point of Swift is to have a strongly-typed static language to use for the things that should have compile time type checking, like building application layers. Having the capability to build your application in a type safe environment while still leveraging a sophisticated dynamic runtime that supports tools and behaviors that make our applications easier to build feels like a huge advantage to me. I think Swift is a great language and I've been enjoying using it to build applications and internally used frameworks. A team I work with just shipped an app built entirely in Swift with a 0.0% crash rate. There's a lot of places where using a static language makes sense, and I'm not ready to judge Swift's future based on whether it could be used today to replicate UIKit, Core Data, or any other Cocoa frameworks. The measure of Swift's success shouldn't be whether or not it eradicates Objective-C from our tool chain. Honestly, I don't think that it should. The value it is adding to our existing tool chain as a foundational component, and the capability it brings to build highly sophisticated and powerful tools like Interface Builder and Core Data earn it a place in our tool kit for a very long time to come. I love this, because I think the building metaphor applies really well to where we are with Objective-C and Swift. The building is Cocoa, and we don't need to re-build the first 20 floors. What's great about the static nature of Swift is it gives developers an option to make that last 20% of code type safe, faster, and more expressive. For a lot of applications and use cases, that's a really great tool to have. As a brief aside, I know that Swift has a lot of promise in areas with no history of a dynamic runtime, like Linux or perhaps even with embedded devices. I'm not trying to diminish that, or imply that Swift has to exist on top of Objective-C. I'm actually very excited about all of those areas and hope that Swift becomes widely used on other platforms. But I won't mind if much of the core platform for Mac and iOS continues to rely on the dynamic runtime. Today I was on a panel at SXSW focusing on the challenges designers face when creating apps for Apple Watch and Android Wear devices. I've spent the better part of the last year and a half building different apps on the Apple Watch, ranging from fitness trackers to news readers and collaboration tools. I really enjoyed speaking on a design focused panel and wanted to continue the conversation by sharing some of my thoughts here on what works and what doesn't when it comes to smartwatch UX. The Apple Watch is both a blessing and a curse for designers. It has a very small screen that provides natural constraints for what you place inside of it. The watch invites simplicity, and welcomes a minimal approach to app design. But it is also very easy to overthink your design and create a complex and confusing user experience. One of the reasons people complain that the Apple Watch is too slow and that apps on the watch aren't great is that many of them are trying to do too much. We're used to iPhone apps that can do 10 things really well. An Apple Watch app can’t really be great if it’s trying to do more than one of them. When it's time to gather around a whiteboard and start designing your Apple Watch app, draw all of your features and start discussing some of your least obvious ones. It’s very likely that one of them represents a better use case for the watch. If you start with the secondary features you might realize that focusing there can actually improve the utility of your overall product. I think there are two great questions to ask yourself when considering a feature for the watch. Will having this feature on the watch make my combined wrist+phone experience better? Or is this feature simply a better fit for the watch than the phone? I think that we are moving towards a place where watch apps become standalone. The Apple Watch is already a great standalone fitness tracker and information dashboard. It's great for quick updates and simple bursts of interaction. But it’s also still safe to assume that the user has their phone with them, so an augmented experience that improves with both devices is also important to consider. What each app does best on the watch will be very different. And honestly it doesn't even need to be an app. Notifications are a core feature of the watch for many users, and providing excellent contextual notifications that a user can take action on is huge win for many apps. Richly detailed notifications are a big differentiator on the watch, and I think that’s an important area for any iOS designer to consider. It’s very hard to do more than one thing well in a watch app. Screen space is one issue, but there’s also limited context around what the user might be doing while using your app. It’s very hard to build an app that will be easy to use in multiple different situations. Scrolling through a grocery list on your watch while sitting on the bus is a very different experience than trying to scroll through it with two hands while pushing a grocery cart. That's why it's better to solve for one use case, and make that one interaction simple, fast, and intuitive in as many contexts as possible. One of the reasons it’s so important to focus on a single use case and keep your design simple is so that you can protect the user from getting lost or feeling like they can’t get to where they want to go. The watch just isn’t big enough for bread crumbs or detailed error states or handling issues like that. Think about protecting the user to keep your interactions quick and to the point. On our panel we discussed the concept of an undo action. How would you undo something on the Apple Watch? Would you scroll down to reveal more buttons, or force press to find a reset button? Or would you just shake your wrist, like the system undo gesture on the iPhone? In reality, none of those interactions work or are standard for this action, and that’s probably for the best because we ought to design our apps such that they aren’t necessary. One example of very focused simplicity on the Apple Watch are the Activity rings. A discerning user might think that if they stood for 6 full hours on a walk and at the park that it should count as a full 12 hours credit on the stand ring, because 6 full hours is a greater amount of time than 12 partial ones. But the beauty of the activity rings is how simple the UX is. There is only one way that system ever behaves. If that ever changed, it would confuse people. The same principle applies to our apps too. If you have to invent logic that changes the behavior of a feature based on information the user doesn't have or that isn't obvious to them, then you can't expect for them to understand what is happening. One of the hardest things to do well in an Apple Watch app is to keep its scope and feature set limited. Usually when you start building the app you’ll be surprised at how easy it is, and that success will lead you to want to do more. Remember that is a slippery slope and take care to avoid overcomplicating your app by trying to make it do more than it should. Avoid the Hamburger Force Touch navigation pattern. It’s also important to prototype and test your designs with users before shipping the final product. The fastest way to prototype a watch design is on paper. Draw out your screens and see how it makes sense to you and your team. You can actually get really far into your design just using paper or a whiteboard, because of how simple a watch app should be. One of the lessons we learned while user testing our apps is that even experienced Apple Watch users are trained to tap and scroll and don’t intuitively reach for the Digital Crown as an interaction mechanism. Adding a coach mark or guide post to the screen to indicate interactivity actually improved the usability of our app quite a bit. We actually validated this by prototyping the feature in code, which was a really great way to try our assumption and get it in front of users quickly to see how they reacted to it in a real situation with working software. It's easy to look at Apple Watch users as just a subset of iPhone users, but I think that’s too shallow of a view of the smartwatch landscape. People that own an Apple Watch and use it every day LOVE that watch. If they're passionate about your app too then you have a great problem on your hands, which is that they want to use the app on their wrist too. There have been a number of key moments for me that showcased just how much users of the Apple Watch care about the device and its software. I remember scrolling through the App Store reviews after shipping a new watch app several months ago, reading the comments left by people excited about the update. People that were excited about the watch app took the time to leave a positive review. Many included ideas for improvement or feature requests. Users of another Apple Watch app I worked on are incredibly engaged on Zendesk. Proportionate to the number of users, there are a lot more comments left about the Apple Watch app, and many of them include very useful feedback from people who WANT to use the app. That was really the key moment for me with this lesson. Apple Watch users are clearly using the app enough to WANT it to be better so that they get more out of it. Remember that these users are motivated to go the extra mile to make the experience on their watch better. I think it’s important to consider that and add watch-specific settings to your iOS app to allow people extra control over the type of notifications they receive on the watch or prioritize content they see on the watch. That’s a great way to keep people using your app who might have otherwise lost touch with it. A lot of people think that third party apps on the Apple Watch are dead. I disagree. I think that third party apps on the Apple Watch are a big opportunity to delight your most passionate iOS users who also use an Apple Watch. Apple will eventually ship a better, faster, newer model of Apple Watch and a new version of watchOS. But the principles of design that we apply to watch apps now will continue to serve us well even as people expect more from apps on the watch. Keeping things simple and focusing on doing one thing really well is the best way to make your passionate users love what you made for them, and serving those users is a very worthy goal while you think forward to future versions of the platform. I've been slowly easing into Swift over the past few months. Some projects I've helped with at work have been in Swift, and my last personal app, Picturesque, was written completely in Swift. I've really enjoyed using the language, but until recently hadn't designed a major new component from the ground up in Swift. Fortunately, last year at WWDC I think we got a great primer for doing this: Protocol Oriented Programming. I've been attempting to follow a protocol oriented methodology, and so far I've really enjoyed it. The rule of thumb I've been trying to follow is not to use classes for anything. It's obviously possible to take this rule to the extreme, but I think it is a good standard to start by for learning how to design in Swift. Without using classes (much), you're left with Protocols, Protocol Extensions, Structs, and Enums. I'm going to cover how I am currently using each of these in my design. Protocols are, of course, the primary interface to what I am building. They represent the capital-T Types that another developer would be interacting with, and the methods they would be calling. But they also represent the plumbing between internal components. For a message passing framework there are public facing protocols like Listening, and internal protocols like Persisting or Encoding. Since Protocols are also just Types, the Listening protocol can have a reference to the Encoding Type that its implementation can use to decode a message. This form of dependency injection has always been a good idea, but the reason this is so useful in a Swift design should become clear below. Not only can Swift protocols inherit from other protocols, but they can also be extended to provide a base implementation of their methods, or add new ones. Using this feature to provide a base implementation of a common protocol is a huge deal for Swift. You know exactly what I mean if you've ever defined a protocol in Objective-C that many classes implement, and had to copy-paste the same method implementation between all of them. I'm also using protocol extensions to drive out the dependency injection scheme described above. Since a method implemented in a Swift protocol extension has very limited access to Self (after all, this isn't a Class implementation), you have to make sure that anything that implementation needs is available from the protocol definition. That's why having your protocol reference other Types, like an Encoding type, is so useful. Those referenced types end up forming the shared base implementation of the protocol. If your varying implementations of the protocol need to change the behavior of one of the base methods, they won't override the method, they'll just override that dependency instead. Enums are my favorite feature of Swift. I don't think we could have asked for a better tool to manage state and branching in our programs. Enums can have methods, hold associated values, and conform to protocols. Their initializers can even take parameters. They're beyond cool. One of the ways that I use enums is to support different behaviors for different cases - a common programming problem. I have an enum conform to various protocols that can return a Type. A message passing system could use an Enum to represent the form of messaging, which could return a different version of the Encoding type for each case. Other implementations only need to hold onto the current case in order to receive an Encoding type for that case, and don't need to care about state. All of that is managed by the enum itself. Generally speaking, if you start to define a switch statement outside of an enum, consider just using an enum instead or adding your functionality to the existing enum. We're still in the early days of discovering what makes for good design in Swift. From what I've seen so far, I'm very excited about adopting a protocol oriented methodology and continuing to learn more about good code design in swift. Swift is clearly a language that presents us with a lot of options from a design perspective. Once we get accustomed to protocol oriented programming, the next big decision to master is going to be when to use reference types (classes) versus value semantic types (structs, and enums). That's a decision we really weren't accustomed to making regularly with Objective-C, but one which presents a whole new set of options to consider in Swift. I don't have an answer for this one yet, but stay tuned for a future blog post. It's prime running season here in Austin, TX and I've finally finished up a new batch of running belt reviews. I've been using several of these belts for a while now with my iPhone 6s Plus, though the FlipBelt Zipper is a very recent (if greatly anticipated) addition. The iPhone 6s Plus is of course the same basic size as it's predecessor, so running with a large iPhone isn't a very different experience than it was last year. But, I do think the popularity of the large phones is fueling a larger market for iPhone running belts, which warrants expanding my reviews to include more products as they come on the market. Note: You can find a link to all of my previous (and future) running belt reviews here at the Running Belt Mega Review. I picked up the Daswise runners belt after seeing the great reviews on Amazon and being curious to try a waterproof belt. Even though I'm usually not taking my phone out to run in the rain, protection from sweat was a key reason for me switching to running belts over armbands in the first place, so moisture protection is a welcome feature. The pocket on the Daswise feels like the right size for an iPhone 6s Plus. It needs to stretch a little when headphones are plugged in, but that's very typical with most running belts. The snugness means that the phone will lay flat while running and not tilt down to either side. I did notice that the Daswise straps were fairly smooth. The friction point between the straps and the buckles is low, making it fairly easy to adjust by pushing on the buckles. For this reason, I feel like this belt was probably designed to be worn with the pocket on your back. In this orientation, one would simply grab both buckles and pull backwards to tighten, or flick forward to loosen. That seems like a natural interaction to me, but for someone who wears their belt facing forwards, I had a little trouble getting the right fit. Once I found the right fit it did stay put without accidentally loosening. While I haven't tested the Daswise out in a storm, I have noticed that my phone feels less damp after a long run when using this belt. I definitely think that it protects against moisture better than my other belts, but I would hesitate to call it waterproof. Fortunately though, the iPhone 6s Plus has been tested as far more resistant to moisture than previous iPhones, and the iPhone 7 is rumored to be totally waterproof, so this feature may not be required for long. The build quality of this belt felt better than the TAPP-C, but not quite up to the level of the higher priced and very popular SPIbelt or FlipBelt. But for the price ($9.99 at time of writing) and with the additional moisture protection, this belt feels like a great bargain. 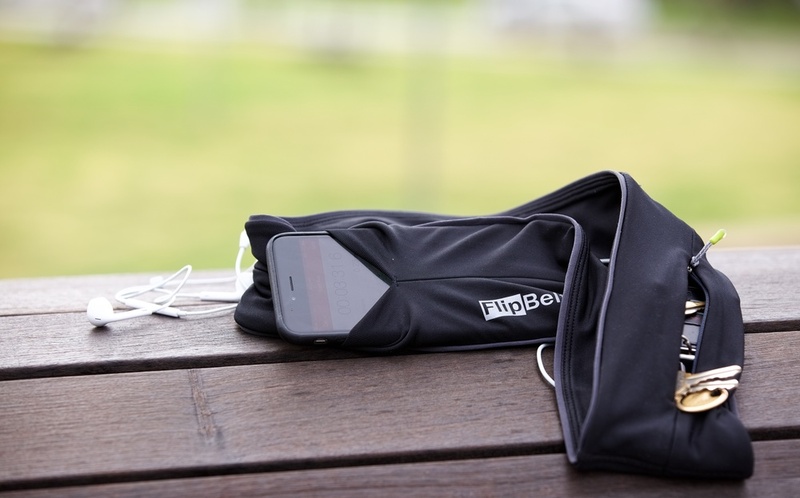 A favorite from my original Running Belt review last year, FlipBelt recently released a Zipper addition that addresses one of my early qualms with the original. Adding a zipper pocket makes a lot of sense for people running with loose items like a credit card or a single key that they don't want to worry about losing. As I noted in my expansion review last year, the FlipBelt has actually become one of my favorite and most used running belts. A lot of this just comes down to comfort. The FlipBelt is soft and fits evenly around you, which makes it feel great for longer runs. One downside is the sizing. FlipBelt isn't adjustable, so if you're really on the bubble between sizes I suggest ordering the smaller of the two. I actually ran into this issue this year because of losing weight. I'm now closer to the Large fit than the XL. My FlipBelt still fits and does work, but it's not quite as comfortable as it was previously. The FlipBelt Zipper retains the great ease of use of the original. Getting your large iPhone 6s Plus in and out is still the easiest of any belt I've tried. Distributing snacks and other objects around the belt to spread out weight or bulk is also still a thing you can do. As for the zipper pocket, it feels well made with a quality zipper, and is actually pretty large. It's big enough to hold an iPhone 6s Plus, but I wouldn't recommend putting it there. You have to really stretch the pocket to make the phone fit, but I think that's fine because that's not the intended use for that pocket. Keep the phone in the primary pockets, and use the zippered pocket for keys/cards/cash. If you've been holding out on FlipBelt until they added a zipper, then this is definitely the one for you. Run Baby's belt borrows an aspect of its design from FlipBelt, going with a slot opening pocket rather than a zipper. While this design for a pocket works well, especially given its size, the other aspects of this belt are very different from FlipBelt. The Run Baby belt uses a large band with a wide buckle. It's actually the largest buckle of any of the belts I've tested. In practice, this buckle felt too large for me. The size of the band and buckle are necessary to support the size of the rest of the belt and its pocket. Of course, having a buckle also makes this belt more adjustable than the FlipBelt, but the tradeoff didn't make this belt any more comfortable. The downside of the Run Baby belt's pocket design and how it impacts comfort is the woven seems around the edges of the main pocket. The seems were irritating whenever they came in contact with skin, scratching in a similar way to velcro. If you tend to wear your belts over clothing this wouldn't be an issue, but I usually run with mine underneath my shirt. The final area where this belt differs from the FlipBelt is around the pocket slot openings. The FlipBelt slots are fairly easy to locate because of an inseam that separates them from the rest of the main seam. The slots on the Run Baby blend in a little more, and are also a tad smaller. My iPhone 6s Plus still fits, but experienced a fair bit of friction when used with a case. While I appreciate the ability to adjust a belt with a slotted pocket, the comfort issues were enough for me not to want to use this belt day to day. Gear Beast's belt is of a minimal style similar to SPIbelt or Daswise. The pocket is only barely big enough to hold an iPhone 6s Plus, and does hold it tightly. The straps are thin, but not too thin. The material is wicking, but isn't advertised to be waterproof. After testing a large number of running belts, I appreciated the tight-elastic nature of the band on the Gear Beast. You can definitely tell that your phone isn't going to end up bouncing around, because the band does hold very fight after you snap the buckle. The band attaches to the pocket in an interesting fashion, whereby the pocket itself sort of wraps around the back of the band. While I can see this being a win for durability, it has the side effect of torquing the pocket around the band. This means that unless your phone is perfectly leveled within the pocket, the compartment could be torqued up into your waist, or down towards your groin while running. This likely wouldn't be an issue for people that run with their belt behind them on their back, however I found it to be a little fiddly until I got the positioning right. Similar to the Daswise belt, the straps on the Gear Beast were fairly low friction. I found them to be just a little bit tighter than the Daswise, making it easier to get the right fit while wearing the belt facing forwards. With the same price and a very similar build quality to the Daswise, it might be difficult to choose between these two belts. I think the difference will come down to fit preference. The Gear Beast will be easier to get and keep the right fit, because of it's higher friction point and tighter elastic. The Daswise pocket is more evenly leveled though, so your phone will sit straighter in the pocket while at rest. Either way, both belts are quite cheap and are a good value. While not itself a running belt, the SPI H20 Companion water bottle does fit nicely as an accessory to really any running belt because of it's clip on design. The companion is marketed as an add on to the SPIBelt (Amazon), but really applies to anyone interested in trying to add hydration to their running routine. What I found while testing the companion is that carrying hydration during my workouts was an adjustment I hadn't really considered before. It's something extra you need to plan for and optimize, and I honestly just hadn't thought about that challenge before. I've been very used to running in urban areas with lots of water fountains, but that's not always something that people have available to them while training. I found the companion bottle to be an easy fit on the belts I tested it with. The clip on the back is easy to use while running. Drinking out of any bottle while actually running is a skill all of its own, but I appreciated the nozzle design of the companion that felt easy to direct the flow of water. The one area that I wish were improved was the angle of the nozzle backwards towards the clip. When worn beneath clothing, I could feel the nozzle rub against my skin. I found myself just tucking the edge of my shirt around it, which had the benefit of preventing the rubbing as well as making it easier to pull out of the belt. While the companion isn't something I carry with me on every run, it is something I can add to one of my belts for longer runs or when I'm out running in a place with less hydration available. Note: SPIBelt supplied me with a SPI H20 Companion bottle for the purpose of this review. So which belt do I choose which running belt I use for a given run? I usually go with lighter weight ones for longer runs, unless I need to carry bars or gels, when I'll choose one like the FlipBelt that offers more options for packing extra goods. Moisture protection isn't a big factor for me, and neither is fit. All of these belts fit me well. Comfort is very important though, and I usually find the smaller/lighter belts to be more comfortable for me, with the exception of the FlipBelt which remains my most comfortable belt. Whichever belt you go with, I'll give one more shout out to running with the Apple Watch. In watchOS 2, Apple further expanded the workout tracking capabilities of the watch, making it a wonderful companion to any runner. I still carry my phone with me when I go running though, which is why I still feel it's important to have a good running belt. I hope this helps you choose the running belt that is right for you. I think it's safe to say that larger iPhones are here to stay, which will make these running belts great running companions for us for a long time to come. When the iPhone 6 Plus came out I decided to buy several running belts to try out for my own use as a runner, and after realizing how much I enjoyed using each unique belt I decided to start reviewing them. Running belts have been a trend for a while now because of how well they solve the issue of carrying a large phone while running. They're quite comfortable, and not overly distracting while running. They're worn over your shorts or shirt which makes them get far less sweaty than an arm band, and they hold other things like keys or food. They're useful for more than just running, more comfortable than velcro arm bands, and are now made in dozens of models. This post is a reference point to those reviews to make it easy to find information about each of the belts that I've reviewed. You can visit each of the reviews for details and images of each belt, or tap the links to visit the Amazon page or manufacturer's website for more information. For runners looking to stay connected with their phone in a belt, running with the Apple Watch has been a great experience for me. It allows me to keep my phone tucked in its zipper pocket while tracking my workout and changing music tracks from my watch. If you found any of these reviews useful and plan to purchase a running belt through Amazon, please consider using one of the affiliate links above to help support this site. Today Apple unveiled what's going to become a whole new world for the iOS ecosystem. Alongside an impressive update to OS X and new hardware announcements like a refreshed MacBook Air and long-awaited Mac Pro came a complete re-thinking of iOS from what seems like the ground up. No stone was left un-turned with this new beginning for iOS. I wanted to talk about what that may mean for the iOS ecosystem's users and developers. Apple has always been a champion for great design. That's apparent in the look of their products. The iconic Macintosh for example, or the elegant and attractive iMacs and MacBooks. The iPhone 5 may be the most attractive device Apple has made yet, with details like the chamfered edging and matte black finish. But in many ways, more important than how it looks is how it feels to hold, and to use. An iPhone just feels right to many of us, the same way that a Mac felt right to us before smartphones. My favorite Steve Jobs quote, which received a mention today at the keynote, is that 'design is how it works'. What Apple has done with iOS 7 is a true testament to that. The design of iOS is no longer about the appearance of rich controls and detailed artwork and buttons. The focus has shifted to how the software makes the experience feel. Instead of rich textures, the layers in an application show through to provide depth and context and keep the focus where it should be: on content. The chrome becomes more muted and gets out of the way when you don't need it and comes back when you do. But more than just the depth and translucency, we can see a big emphasis on motion and interaction. Shifting a background image based on how you hold your phone. Changing the angle of tabs in Safari. Even something as small and simple as shrinking, but not hiding, the URL bar in Safari as you scroll up. All of these are delightful touches that help bring an app to life through interaction. Parallax, blur and many of these techniques have been possible on iOS for some time now but this shift in iOS 7 shows which direction Apple sees the design winds blowing and I am excited to see them embracing it and taking the lead on the future direction for the platform. At Google I/O a few weeks ago, I was disappointed with the lack of focus on developers building immersive experiences centered around great look and feel. Design is clearly important to Google. The polish and design in many of their own recent products is a testament to that. And while there were some good sessions around animation technology and UI design, I don't think you could say that it was a major emphasis from them to developers. And that's why I am so excited about iOS 7. To me, it's not just about the lack of skeumorphic elements or linen backgrounds. It's about a focus from all angles on delightful user experience and engaging motion design in applications. Like with the introduction of iOS, Apple has set the bar for developers with iOS 7, and is giving us great tools to build these same kinds of experiences on the platform. I'm excited that they are pushing us forward and can't wait to see more of what everyone is going to build on the new version.